Dimitri Bondarenko studied organ and piano at the Gnessin Academy of Musik Moscow with A.Fiseisky and V.Nossina. He then attended the University of Music and Performing Arts in Vienna where he studied the organ with M.Haselböck and the harpsichord with Wolfgang Glüxam and Augusta Campagne. 2003 he was the second-prize winner of the International Tariverdiev Organ Competition in Kaliningrad. As a member of the ensemble “La Clelia” he won the "Musica Juventutis"-Competition in 2010. He performs as a soloist and as a member of various ensembles and orchestras (e.g. Wiener Akademie, Bach Consort Wien, Moderntimes_1800, Chorus sine nomine, Neue Hofkapelle Graz, Wiener Kammerorchester, Tonkünstler-Orchester etc.) in Europe, Russia and the USA. He also performs at different festivals, opera projects, CD- and TV-recordings. Since 2012 Dimitri Bondarenko teaches at the University of Music and Performing Arts in Graz (correpetition, harpsichord, basso continuo). 2016/17 he had also been teaching at the University of Music and Performing Arts in Vienna. 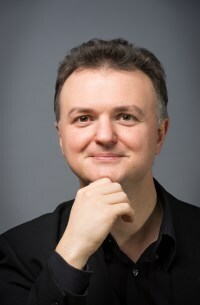 Since 2010 Dimitri Bondarenko teaches regularly at different masterclasses (Austria Barock Akademie, Werktage der Alten Musik Weiz).